It’s no secret that the small crossovers that are increasingly populating the roads are a bit of a façade. They are trying to come off as capable off-road sport utility vehicles when really they are something else entirely. Some are pretty effective at pulling off that rugged truckish look that so many buyers seem to be taken with. Others can barely disguise the reality that they are basically just jacked-up hatchbacks with wheel cladding and possibly all-wheel drive. The Mazda CX-3 is a perfect example of the latter. 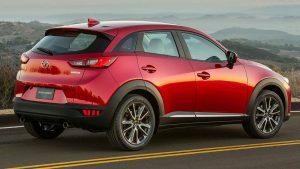 Positioned below the CX-9 and CX-5, the smaller CX-3 shares its underpinnings with the Mazda2, a subcompact hatchback sold elsewhere around the world. Dimensionally, it is the smallest vehicle in the Mazda lineup, smaller even than the compact-sized Mazda3 Sport. It is sharply-styled and quite handsome, which is rare thing in this segment, but there’s no getting around the fact that this is basically just a tallish hatchback. It’s actually a pretty weak effort at an SUV lookalike, but, to be fair, the same could be said of other small crossovers. Mostly thanks to its compact dimensions and low curb weight, the CX-3 does drive as well as it looks. Handling is impressive with very little body roll when hustled through the corners. It’s agile and lively without being punishing on rougher roads. It’s also a cinch to maneuver around town. At 146 horsepower and 146 lb-ft of torque, the 2.0L 4-cylinder engine is no powerhouse, but it feels reasonably spritely and is well-matched to the fun 6-speed manual shifter. A conventional 6-speed automatic is available as well. In terms of fuel economy, this front-wheel drive manual-equipped tester managed an average of 8.0L/100km in mixed city and highway driving, which isn’t bad either. The biggest issue with the CX-3 is that, for a sport utility vehicle, it doesn’t exactly offer a whole lot of utility. The interior is less spacious than you’d probably expect from a vehicle of this type. The backseats are a struggle to access and don’t have much space for adults or even children when a couple of tall adults are seated up front. The cargo area too is surprisingly small. This is clearly a crossover aimed at singles and couples rather than families with kids. The front seats though are reasonably comfortable with a good driving position and well-designed controls. The infotainment system can be a bit fiddly to use with a few too many clicks and menus for common functions. It also lacks Apple CarPlay or Android Auto, but it’s far from the worst user interface out there. The CX-3 is available in GX, GS, and GT trim levels, all of which are aggressively-priced and come well-equipped. The GX starts at $19,995 with the manual gearbox or $21,295 when equipped with the automatic transmission. The $22,695 GS trim adds a few extras including heated seats, heated leather-wrapped steering wheel, low-speed automatic emergency braking, and blind-spot monitoring with rear cross-traffic alert. A $1,600 Premium Package includes leatherette seats and a sunroof. For $27,995, the top-trim GT throws in leather and “lux” suede seating, power driver’s seat, Bose sound system, navigation, and a colour heads-up display. All-wheel drive adds $2,000 to all trim levels and both the GS and GT offer additional active safety features such as adaptive cruise control and lane departure warning as part of a safety package. The CX-3 has a lot going for it including an attractive design, great driving dynamics, and aggressive pricing for a crossover. Still, the lack of interior space is a major drawback that puts it at a disadvantage when compared to far more practical competitors such as the Honda HR-V, Nissan Qashqai, and Subaru Crosstrek. 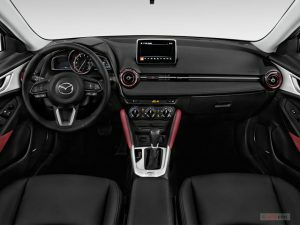 Those looking for a well-rounded package with a Mazda badge will probably be better served by the Mazda3 Sport. 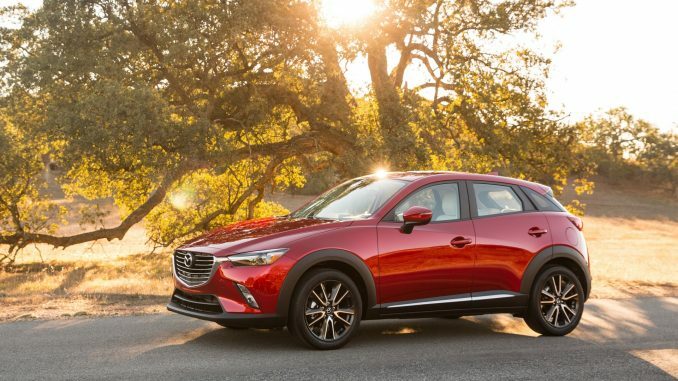 It may not have a high-driving position or available all-wheel drive like the CX-3, but it is more attractive, more spacious, more affordable, more powerful (much more powerful in the case of the GT trim) and even a bit more fun to drive. It’s definitely worth a go before making a decision.